Tearing apart the Human Rights Act. 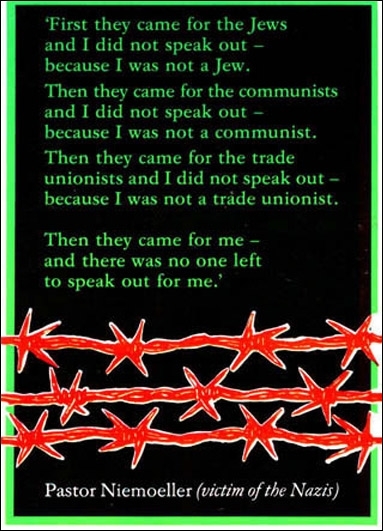 After the no vote in Scotland on 18 September I felt scared. There will be a backlash, I thought. Scotland has risen up and tweaked the whiskers on the imperial British lion. We’re going to get a kicking. Maybe that’s paranoid but I don’t think it’s entirely unjustified. Already there are murmurs about scrapping the Barnett Formula because it “robs Wales” (divde and rule, anyone?). And let’s not forget our very own local councils trying to penalise people who signed up to the electoral register by hunting them down for ancient poll tax claims in what must the single most cynical and undemocratic move I’ve seen for many a year. Nicely done. Now that sense of dread is only increasing, only now it’s not because of a fear of some sort of scorched earth policy making. It’s because of the realisation that far from being Better Together, we’re still living in the shadow of Westminster decision making. It means the land under our feet isn’t our own. Literally. At the end of September the UK Government announced that – despite objections from the Scottish Parliament – they were removing householders rights to object to oil and gas drilling and fracking under their homes. Licences are already up for sale and the prime territory is where? Oh that’s right. Scotland’s central belt. It seems Scotland’s natural resources remain a shiny prize despite our oil allegedly being about to run out. It makes me feel a little bit sick that decisions are being made for us by people who don’t seem to give a toss about our land or our future. I’m sure if I were still living in the North of England I’d still feel the same. George Osborne’s father-in-law considers the North of England to be “desolate” and “derelict” and thus ideal for fracking, unlike the verdant rolling hills of the conservative voting home counties where fracking might lose them a vote or two. And there’s the prospect of being back at war, sending air strikes into a country that by screwed up in the first place. That way we have a group of people whose mission it is to pressure Westminster to deliver on the promises that they made to Scotland. A group of people who will represent the best interests of people in Scotland. But is that clearing the way for the Tories? Or worse still a UKIP – Conservative coalition? 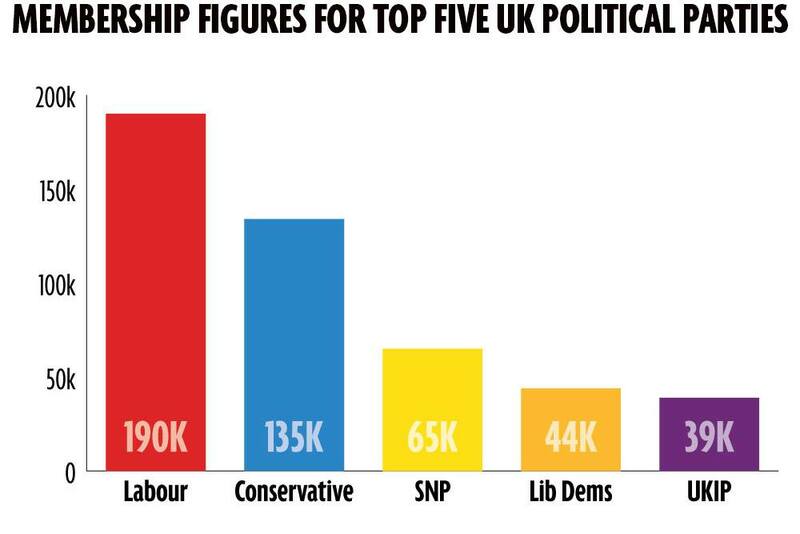 UKIP are now nearly as large as the Lib Dems. OH GOD. Some people think that it is, and that’s a sobering prospect indeed. The song says that the first cut is the deepest, but they ain’t seen nothing yet. – more ideologically driven welfare reform, penalising the most vulnerable people in our society for the outrageous debts run up through banking deregulation. So how do we stop that from happening? We vote for their most significant left leaning rival of course, in the hopes of unseating them. We vote Labour. Labour? But wait a minute…. Labour don’t want an independent Scotland. Labour has ignored the people for whom it was created for the past twenty years. Like the best friend who has been overlooked and taken for granted, in order to be popular with the rich kids down south, Scotland hasn’t really had a great time with Labour. And come to think of it, are Labour really still left wing? New Labour discarded socialist economics a long time ago. It was under New Labour that the rich got so very much richer and the gap between the rich and poor increased. Yes, they did improve conditions for the poorest people in society, but didn’t increase equality. And Gordon Brown’s lack of control over the greed of the banks sent us into economic chaos and delivered us into George Osborne’s austerity clutches. We’ve been taught so well to believe that bailing out the banking and introducing austerity measures are essential to saving us, we all believe it. Even if it isn’t true. 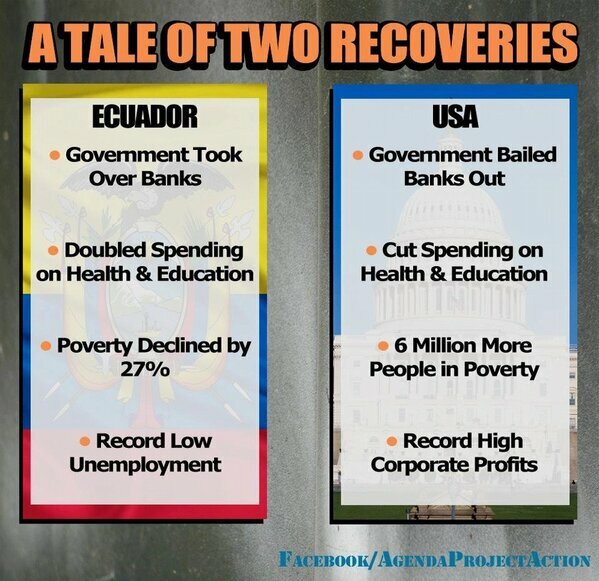 Compare the USA and Ecuador (see left). On the back of the recession we could have chosen to do what our forefathers did in the wake of the Great Depression and subsequent wars. We had an opportunity to build a more economically just society on the back of the recession and we chose not to do so. We chose to bail out the banks (Labour’s choice) not to nationalise them. And then, by electing the Tories and their austerity measures we chose to penalise the poorest and most vulnerable for that decision. There are not unavoidable decisions, though we might be told they are. They are ideological decisions. I don’t believe that if the Labour Party get a mandate in the next General Election that they will drift left. It didn’t happen in the last Labour administration. But more importantly, it doesn’t matter what I believe. Because in the vast majority of General Elections since WWII – THE SCOTTISH VOTE DOESN’T MAKE ANY DIFFERENCE. That’s right. When Labour wins a majority in a UK General Election, it is because people in England have voted for them. There are barely any elections where the Scottish vote has made a difference to the final result. So Labour won’t be appealing to the Scottish vote in this election, they’ll be looking to their friends in the South East of England. If they don’t win them, they don’t win the election. And if this IS one of the tiny proportion of General Elections where Scotland’s vote actually DOES count, I’d like to see the Labour Party seeking a coalition with Pro-Independence parties to form a government.